Assembly and Testing Services | Meyer Tool & Manufacturing - Meyer Tool & Mfg. Testing is a large part of what we do here at Meyer Tool. We manufacture many one of a kind pressure vessels and vacuum chambers and they do not leave our doors until we confirm that they are leak tight and operationally fit per the customer specifications. 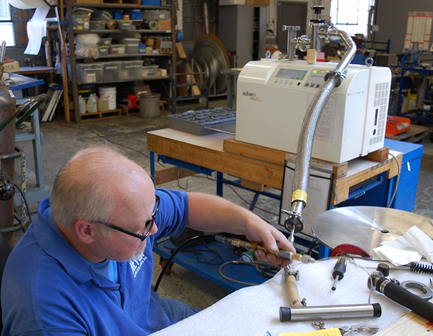 Our assembly technicians are trained in Helium leak testing to ensure that all vacuum chambers big and small will work properly from the first time they are put into production. We are also capable of performing both pneumatic and hydraulic pressure tests based on project and customer requirements. We commonly perform various electrical and temperature sensor related tests to ensure proper wiring and performance standards are being met. Helium Leak Testing on a custom fabricated Aluminum cryostat chamber for a deep space telescope. Helium leak testing Stainless Steel tube weldments. Request hELIUM lEAK tEST qUOTE! 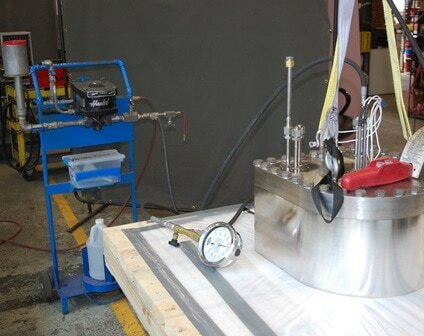 Pneumatic pressure testing of ASME code natural gas process vessels. All ASME code stamped Section VIII pressure vessels must undergo a pressure test. The pressure test is meant as a verification of the vessel design and workmanship. The test must always be performed after all other fabrication steps are complete. Nitrogen is used to pressurize the chamber. Pneumatic tests are inherently more dangerous than hydrostatic tests. All vessels must must be examined under the requirements of UW-50, which requires that all openings, welds, and attachments be examined before testing. - LSR = Smallest ratio of the allowable stress at test temperature to the allowable stress at the design temperature of the materials used in the vessel construction. 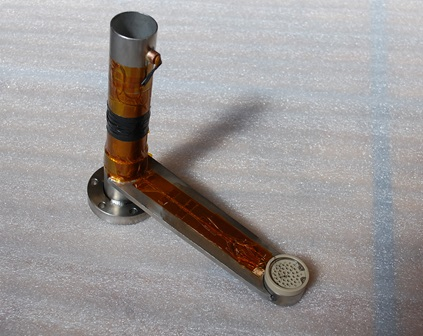 The Code requires the temperature of the vessel and its contents are the same and between a range of 30°F above the minimum design metal temperature (MDMT) and 120°F. ​After these tests are performed, the vessels are finally stamped to display that they meet the ASME Code and Meyer Tool standards, ensuring the safety of our customers and their projects. Request Pneumatic pressure test quote! Hydrostatic testing of a semiconductor process chamber. Hydrostatic testing is the default type of testing per the ASME code. Hydrostatic testing is inherently safer than pneumatic testing because the compressed gas has a much higher energy content compared to that of water. Despite the safety advantages of a hydrostatic test there are still instances in which a pneumatic test is required. Pneumatic tests are used when the vessel cannot be properly drained or when the test fluid is not compatible with components of the chamber. A hydraulic pressure test is performed by filling the vessel and pressurizing the chamber to the test pressure reuired by the code. Once the hydrostatic test is complete the vessel is drained and disassembled so that it can be thoroughly cleaned. The vessel is then reassembled and packaged for shipment. request hydrostatic pressure test quote! 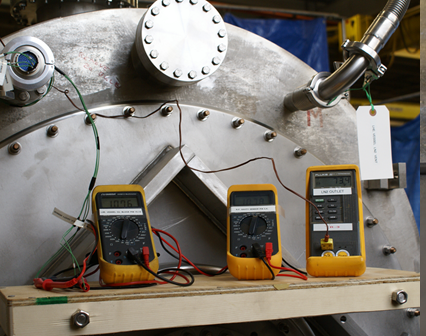 Electrical testing of temperature sensors installed inside a custom fabricated cryostat. Example of diode temperature sensor installation and wiring to a data plug held in place with Kapton tape. Usually, the wiring will also be wrapped with MLI (insulation). We will frequently have to attach temperature diodes and thermal couples inside the various chambers that we produce. This process usually involves the careful handling of very thin gauge wires that snake their way along various piping, heat exchangers, and internal process vessels until they reach the outer vacuum or pressure shell. We are familiar with wiring techniques to keep the wires electrically and thermally isolated and we are fully capable of performing both in-process and final electrical wiring performance tested to ensure proper operation of the chamber. request ELECTRICAL WIRING AND SENSOR TEST QUOTE! This video shows the liquid Nitrogen cold shock testing of a series of distribution box nozzle welds. 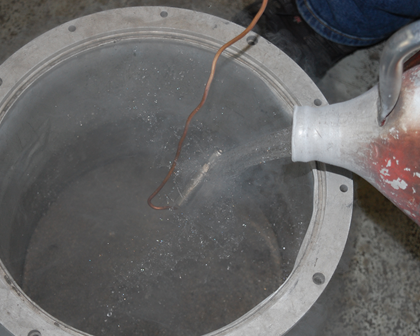 A small weldment is immersed in liquid Nitrogen in order to thermally stress the weld and open up any potential crack prior to Helium leak testing. 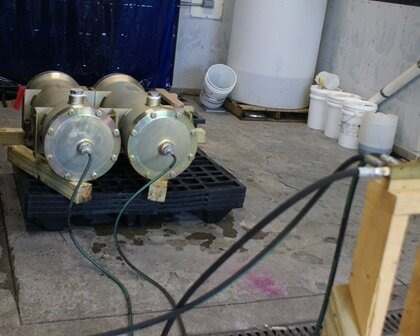 Cold shock testing is performed after welding and before Helium leak testing. Cold shocking is a way to thermally stress the welds and enlarge any potential voids or cracks in order to make them easier to detect during Helium leak testing. The basic process involves flooding the weld zone with liquid Nitrogen so that the part rapidly cools down then allowing it to warm back up to room temperature. In some cases a flame will be applied to rapidly warm up the weld and increase the amount of stress applied to the weld. Small parts can be totally submerged in LN2 while larger assemblies will have LN2 sprayed directly on the weld areas. When fabricating products for vacuum service even the tiniest leak can become a major problem. Aluminum welds are notorious for various weld defects like pitting and porosity so it becomes very important to stress the welds and increase the sensitivity of the leak test. request COLD SHOCK TEST QUOTE! 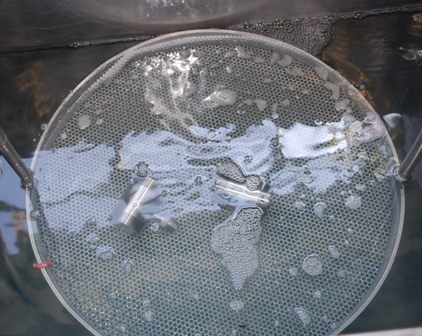 Parts are cleaned in an ultrasonic cleaning tank as the initial phase of a multi-stage cleaning procedure. Some of our most stringent cleaning procedures were developed while fabricating products for the National Ignition Facility, (NIF). NIF is the world's largest and most powerful laser facility ever built. In order for the optical systems to work flawlessly, extreme attention to cleanliness must be maintained. We setup a HEPA filtered, positive pressure, temperature controlled, clean room specifically for the final assembly and fabrication of both Stainless Steel and Aluminum beam line components. Our cleaning procedures involve a combination of solvents, acids, and ultrasonic cleaning steps. Special containers, clothing, and PPE is utilized in order to reduce the presence of particulate contaminants. We are highly experienced fabricating and preparing products for vacuum service. Not only do we have extensive work procedures for cleaning ultra high vacuum components but we can adapt to any additional requirements that your custom project requires. request UHV PRECISION CLEANING SERVICES QUOTE! This video runs through the basic process used to perform a dye penetrant test. Dye penetrant application on Stainless Steel pressure vessel end caps. 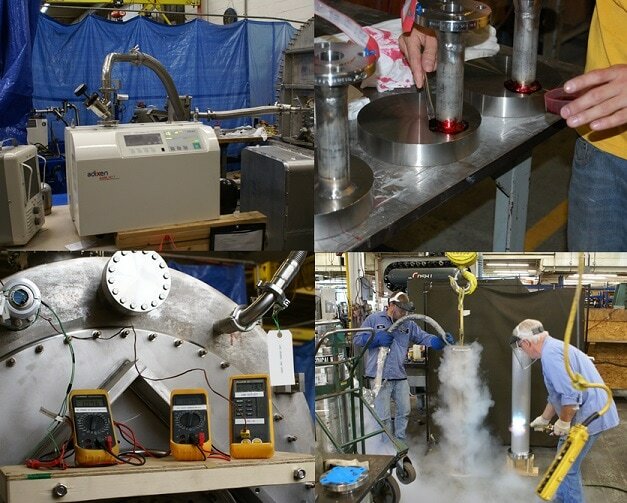 Dye penetrant testing is a non-destructive testing process used to detect weld defects. The process involves first thoroughly cleaning the weld zone of a part. A red dye is then applied to the area. The red dye has a very low viscosity and can get into very tiny voids and cracks. A special cleaner is then used to remove all visible signs of the red dye. Although the red dye may appear to have been cleaned away, small traces of the dye will be left inside any tiny pores or cracks in the weld. A white developer is then sprayed over the surface and allowed to react with the red dye. If there are any defects, the red dye will be absorbed into the white developer and show up as tiny red dots that are easily detectable against the white developer. Each step in this process is carefully timed to allow for proper reactions to take place. 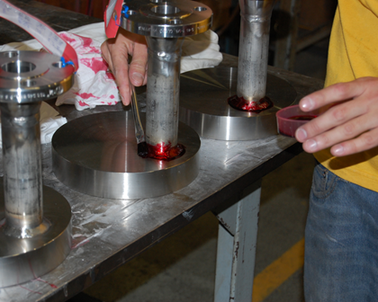 request ASME CODE DYE PENETRANT TEST QUOTE!